Our product range includes a wide range of Blood Bank Instruments such as Tecsonic Data Logger Scanner, Blood Bag Tube Sealer, Blood Collection Monitor, Platelet Incubator, Platelet Agitator, Cryoprecipitate Bath and many more items. 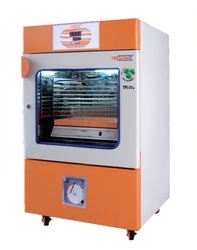 TECTONIC Platelet Incubator provides an ideal Storing environment for the Platelets. This unit Designed to maintain a stable and uniform temperature of 22.0 DegreeC, The user-friendly design includes an acrylic inner door, and see through outer door, simple calibration is possible via the control panel. This, coupled with a visual and audible alarm system, ensures that your samples are both safe and secure, but also easy to access when you need them. Micro Controlled Temperature controller with Audio Visual Alarm for high & Low Temperature. The unit is mounted on castor wheel for easy mobility. 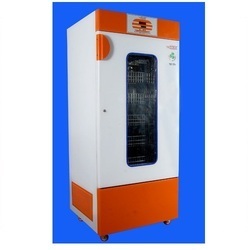 NIC Platelet Incubator provides an ideal Storing environment for the Platelets. 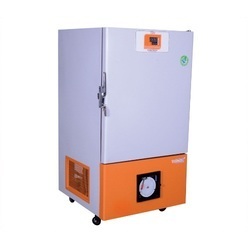 This unit Designed to maintain a stable and uniform temperature of 22.0 DegreeC, The user-friendly design includes an acrylic inner door, and see through outer door, simple calibration is possible via the control panel. This, coupled with a visual and audible alarm system, ensures that your samples are both safe and secure, but also easy to access when you need them. 7 Days circular Temperature Recorder. Sealing time Approx 1.5 sec. 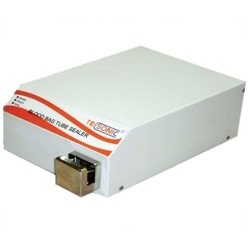 TECSONIC Blood Bag Tube Sealer is a compact installment to seal the Blood Bag pilot tube by radio frequency sealing system, no haemolysis at Blood in the tube because Radio Frequency sealing seals the tube without damaging the blood cells inside, and easy separation of tube once the sealing is done, sealing can be achieved in less than 1.5 sec. per tube by simple operation. Blood Collection Monitor is a compact unit that provide safe and smooth action to ensure Mixing of Blood and Anticoagulant without damaging Blood Cells during collection of Blood from a donor. Volume can be set 1ml increment. Facility of pausing during collection and also can change preset volume. Microcontroller based program to give better accuracy Auto tare facility. 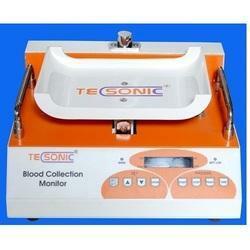 Motorised pinching system at the end of collection to prevent excess blood from the desired volume. Facility to check, set volume, gram and time totalizer during collection. Audio video alarm if the flow is less than 15 ml/min and Audio Alarm at the end of collection. 5) Battery Backup --------- 4 to 7 Hrs. 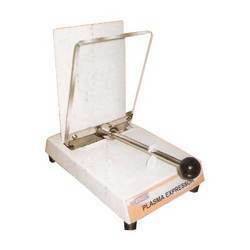 TECSONIC Plasma Extractor is designed to Extract Blood component from centrifuged Bags. The spring loaded front panel applies pressure on the collected bag causing the liquid to contain in transfer bag. Its sturdy construction makes it durable and reliable, easy to use and portable. The unit is available in both versions automatic and manual. 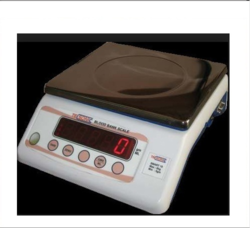 TECSONIC Micro Controlled Blood Bank Scale is designed for weighing Blood and Blood Components with display of Weight and Volume. LED or LCD displays of Weight and Volume with accuracy of +- 1ml/grm. Helps better balancing of refrigerated centrifuge. Tare provision to account for the weight of the blood bag. Labtop Blood Bank Refrigerators are available in 9 basic cabinet sizes, designed to fit a variety of spaceand storage requirements. The refrigerators are equipped with heavy-duty compressors and directairflow cooling system to maintain a vital operation temperature of 4.0°C. Combine superiorrefrigeration technology and precise temperature control to ensure reliable blood storage. Special FeaturesMicro-controller controls the internal temperature at 4.0°C with temperature variation within ± 0.5°C.Unique air flow system ensures even temperature distribution.Foamed - in - place CFC Free PUF insulation ensures temperature stability and reduced energy consumption.Audio visual alarm when the temperature deviates from the preset temperature.Built in 7 days circular chart temperature recorder.Stainless steel heavy duty basket ensures even temperature distribution. TECSONIC Plasma Freezer Provides an ideal freezing environment for the preservation of Plasma bags and test samples. This unit Designed to maintain a stable and uniform temperature of up to -35.0°C, (-40.0°C in AC Room) and available in Vertical & Horizontal with four different sizes. The user-friendly design includes a built-in Stainless steel insulated inner door, and simple calibration is possible via the control panel. This coupled with a visual and audible alarm system, ensures that your samples are both safe and secure. Heavy Duty Stainless Steel (304) Basket. Extra-strength non CFC refrigeration System. Adhering to the industry standards and norms for qualitative production, we have successfully attained the name of reliable manufacturer and supplier of Low Temperature Freezer. This freezer is manufactured under the firm guidance of expert supervisors using best quality materials and components. We offer a wide range of Blood Bank Refrigerators that are comprehensively designed for convenient and secure storage of blood samples, vaccines regent cultures and bone marrow samples. These can be easily customized according to the specific and diverse requirements of our clients. Looking for Blood Bank Instruments ?